On Saturday 9th February the first XV will entertain Charlton Park who are currently in third place in the league. The reverse fixture in mid October was a close run thing with the hosts taking it 27-26 with the final kick of the match. Jim Green is back in Wanderers front row and Connor Brown moves from the 2s to replace the injured Andy Letts. Can the Wanderers upset the form book? Your support as always is crucial. Lets make home advantage count. There's another attractive match on the neighbouring pitch where the 2s take on Medway in the very competitive Premier 2 east league. Both games will kick off at 2.30. The game will be followed by a Race Night hosted by Mike Pond. Can you beat the book? 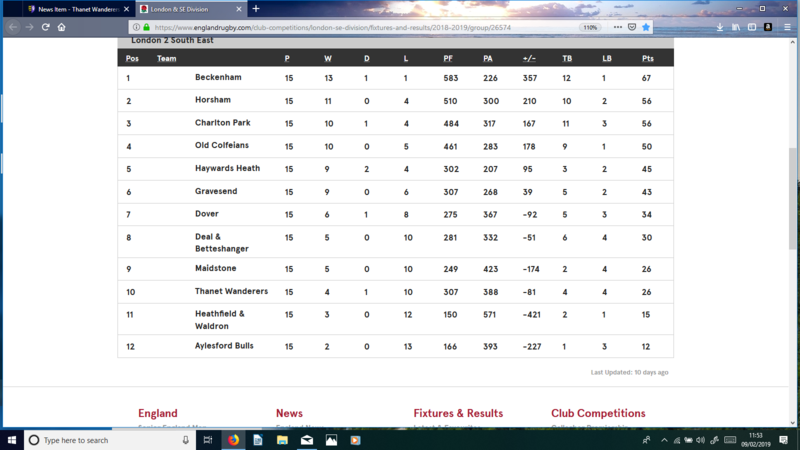 On Sunday Chris Marson's U15s have a Kent Cup Quarter Final against Blackheath. KICK OFF 10.45.If you haven't caught up with this very promising group so far, this would be a good match to start.